Blowing up your lab is usually discouraged, but it’s part of the experience when you’re learning online. Nicola Jones is a freelance reporter based in Pemberton, British Columbia, Canada. When I enter the lab, I see an open flame on an unattended Bunsen burner. The fume hood is open and a pile of explosive chemicals sits in the middle of the floor. In a fit of devilish abandon, I take off my lab goggles and pour an unknown liquid into a dirty beaker. It explodes, spraying acid into my eyes. Don’t worry, this is only a computer simulation, one of 70 produced by the Danish company Labster, based in Copenhagen. The experience looks and feels like a video game but its purpose is more serious: supplementing, or even replacing, laboratories for students who are unable to afford or access the real thing. Arizona State University (ASU) has launched its first fully online biology degree course that uses simulations instead of actual lab work. Labster has collaborated with Google Daydream to provide 30 three-dimensional (3D) lab simulations for the course, and says that more universities are likely to follow, including the University of Texas at San Antonio. The idea of ‘virtual labs’ is gaining traction as companies and institutions try to expand their reach, cut costs, enhance student understanding, and provide a different kind of hands-on training for future scientists. For example, edX — the world’s largest non-profit platform for free, online university courses — is due to launch its own lab simulations later this year in a project called LabXchange. “The real lab is actually very limiting,” says Brian Woodfield, a physical chemist at Brigham Young University in Provo, Utah, who has been developing virtual labs for decades. “A lot of it is toxic. We can’t let them blow up things. We have limited time, and there are safety issues all over the place.” The virtual world, by contrast, is free of such restrictions. Virtual labs range from stripped-down 2D video games, which use simple toggles to control a handful of variables, to 3D simulations that aim to provide a more immersive experience. Some provide students with an objective and step-by-step instructions, guiding them through the technical steps for carrying out complex procedures. Others are completely open ended. Woodfield’s Virtual ChemLab, for example, lets students choose chemicals from a store-room shelf and use them however they want. “That’s real chemistry,” he says. The inventors of virtual labs extol the benefits of technology for improving education, and emerging data suggest they are right: virtual labs do improve some test scores and help students to prepare for real-life scientific investigations. But there is still debate about whether they really enhance learning over what a textbook can provide; whether fancy graphics are helpful or just a flashy distraction; and whether simulations really can (or should) replace real lab experience. Labster and other similar products, including Late Nite Labs from Macmillan Learning, try to make users feel as if they are really in a lab. Labster’s simulations have shadow and light, and allow users to ‘walk around’ — I spent much of my first few minutes in their sim orienting myself, working out where the doors were and how to navigate the space. A robotic voiceover guides users through the tasks, from putting on a lab coat to operating a DNA sequencer. When a procedure involves physical acts, they have to be mimicked by the user: a pipette must be picked up and a tip added, and then used and thrown away, each step performed with the click of a mouse or trackpad. The interface can be clunky and frustrating at times, and the required acts are repetitive, which is arguably a fair simulation of reality. The virtual lab world is clearly not backed with the same dollars as the video-gaming industry. But there is still attention to detail: the labs are populated with characters who talk to you, and there is a view out of the windows; there are even quirky wall posters. Such details may not be necessary for teaching, but they help to enhance the immersive quality. The theory is that users who feel they are really in a space will devote more time and attention to it, and so benefit more from the experience. Labster’s stock of simulations ranges from an entertaining romp through basic lab safety, such as the 2D sim that sprayed my eyes with acid, to highly technical procedures including cancer sample preparation for mass spectrometry. The price ranges from US$10 for one simulation to $199 for full access per student per term, although this is under review. Most simulations are in the fields of biochemistry and medicine (including viral gene therapy and DNA sequencing). These topics, says Labster’s co-founder Michael Bodekaer, tend to be “too dangerous, too time consuming or too expensive” to do in a real laboratory. Many of their simulations use storytelling to make them more engaging. In the animal-genetics lab, for example, the player visits a farm to sample meat, before learning how to develop a DNA test for double-muscled cattle (a genetic variation that allows animals to have more muscle fibre and less fat) and then playing detective to find out whether meats labelled as organic are abiding by the rules. There are clear benefits to this ‘gamification’: it seems to increase student motivation, which is not a trivial achievement. But whether any one simulation actually improves understanding or just lets students have fun blowing things up depends on the fine details of how they are designed. Simulations can be particularly useful, she says, if they let students play around with things that are normally outside their control. “The ones that are really valuable are the ones that allow students to explore complex phenomena that you can’t explore with the naked eye: rapid airbag deployment, chemical reactions and climate change,” says Linn. “We couldn’t do hands-on investigations of those before.” The graphics do not need to be fancy: you just need to see circles representing molecules dancing around to illustrate temperature or pressure, for example, or lines showing weather fronts moving around. 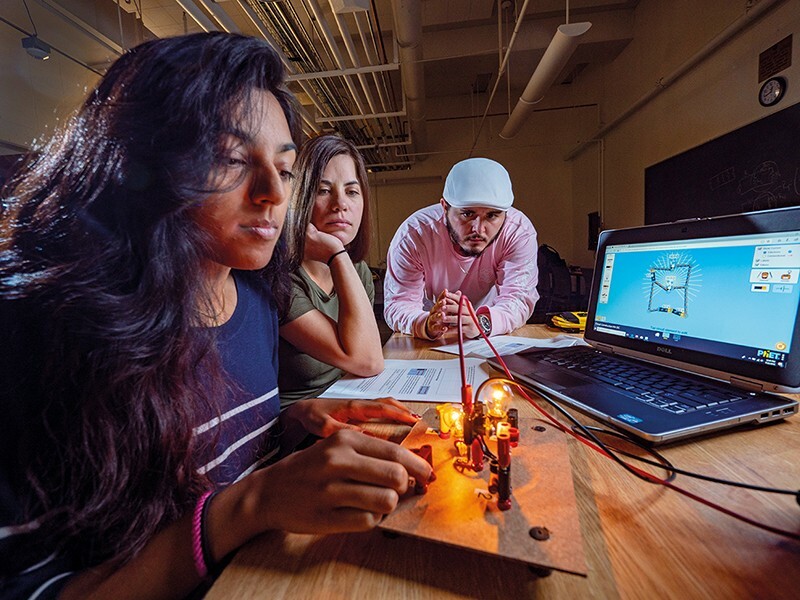 At Berkeley, says Linn, the science faculty often use PhET Interactive Simulations in their courses — free online sims produced at the University of Colorado Boulder that explore core science concepts, such as how a circuit works or what controls pH. PhET was founded by physicist Carl Wieman in 2002, a year after he won a Nobel Prize for his work on Bose–Einstein condensates, as he turned his attention to science education. PhET sims are now used about 90 million times a year. These sims have simple graphics and allow a large degree of freedom for action within the confines of exploring a simple scientific principle. Users might, for example, make waves in a wave tank and watch them interact. Students can set whether the waves are sound, light or water; where the waves originate; their frequency and amplitude; and whether they go through a slit at the far end of the tank. In this way, the basics of wave physics are played out in an easily tweakable demonstration. The graphics are often no flashier than those in a typical textbook, but the interaction aims to provide more intuitive ‘aha!’ moments than you would get from a static reading exercise. 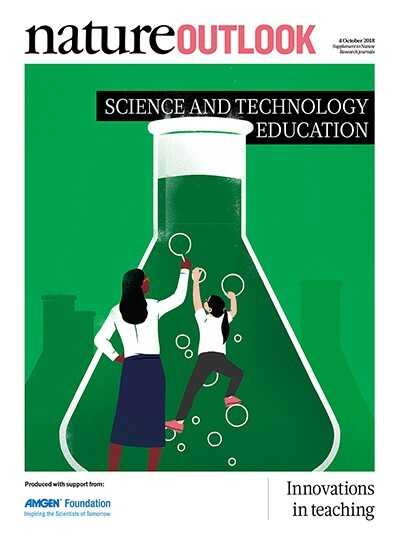 Many studies have found little difference in learning outcomes between students who do virtual lab experiments and those who do them for real, whether it is undergraduates learning about heat exchange, or children at elementary school investigating springs1. The main difference is that you cannot physically touch anything in a virtual lab, but this has surprisingly few limitations. The studies that show a detriment typically involve a completely unfamiliar physical task, such as children aged 5–6 learning to use a balance beam. A few quantitative, controlled studies of more-immersive simulations are also starting to emerge. Mads Bonde, Labster’s co-founder and chief executive, worked on one of these at the Technical University of Denmark. Bonde and colleagues gave half of the students in a first-year life-sciences class access to a Labster simulation of a crime-scene investigation. When tested, the students who did the simulation scored, on average, 76% higher than those exposed to traditional teaching2 (the difference disappeared when the students swapped groups in the second half of the study). Perhaps unsurprisingly, 97% said they felt the simulation made the course more interesting. Kambiz Hamadani, a biochemist at CaliforniaState University San Marcos, has been using Labster in his classes for two years. “Funding is tight, and space is limited, and we have a lot of students of different sorts and we have to teach them all,” he says. Virtual labs are well suited to those situations, he explains, allowing students to work at different rates from home. As well as using virtual labs to improve understanding, Hamadani also uses them to cope with the limited space in real labs, avoiding scheduling conflicts by shifting some lab studies into the virtual realm. Hamadani secured a grant through the California State University system to redesign his courses using Labster and assess the shift. In 2016, he essentially copied Bonde’s procedure, using a Labster simulation of enzyme kinetics. He had a small class of 45 students, and the test involved only a few dozen questions, but Hamadani still saw improved results. On test questions that delved into higher-level understanding by requiring the application of learned ideas, those with access to Labster did 40–50% better than their peers. However, the recall of facts and definitions took a hit. “The Labster students are clearly diverted from textbook learning — their performance on textbook-type questions actually drops,” Hamadani says. Hamadani used the 2D version of Labster. He says the 3D one would have been both too expensive (it requires more hardware, including smartphones and viewers) and potentially not worthwhile from a learning perspective. High levels of immersion through 3D technologies are thought to increase engagement and emotional investment. In theory, this should set the stage for more in-depth learning, says Guido Makransky, an educational psychologist at the University of Copenhagen who puts virtual labs through their paces. But spicing up a potentially boring topic with an immersive 3D experience does not always help, he adds, because students might get distracted. “Learners are curious so they try to play with things to see what will happen,” says Makransky. They spend their time wandering around the virtual world, rather than focusing on the task at hand. Some of Makransky’s other studies showed that virtual-reality sims, whether 2D or 3D, can impart knowledge better than a textbook. “That’s really exciting. That’s exactly the results we were hoping to see,” says Bodekaer. All this implies that virtual labs can be used to replace some real-world labs, just as Hamadani has done for his students. But replacing the entire lab component for a science degree is unusual. “There are a few other biology degrees offered online, but most are bachelor of arts degrees,” says Amy Pate, instructional designer at ASU’s School of Life Sciences. 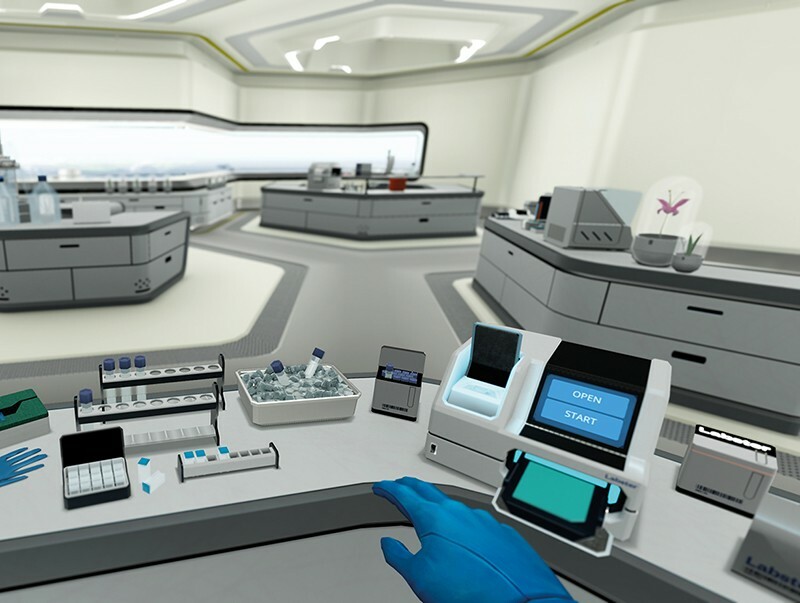 From this term, her university is using a set of 30 virtual simulations made by Labster in collaboration with Google Daydream for three of its core lab courses: cell and molecular biology, animal physiology, and ecology — but students need to take a real-world organic-chemistry lab. “The learning objectives and rigour of the course are the same, regardless of the modality in which the student learns,” argues Pate. There are still fundamental differences between real and virtual labs, of course. The data in simulations tend to be less messy, leading to faster, cleaner learning. And without the distraction of trying to physically wrangle equipment into working properly, students can spend more time understanding the principles behind the science. But this also means they get less practice in working out how and why things go wrong, and have less experience with the arguably useful emotion of frustration. “It’s really different to encountering a conundrum in the lab,” says Linn. “Maybe you put your materials too close to the fridge and it interfered.” That level of complexity is not available in simulations — not yet anyway. For Labster, the future lies in customizable sims that can be adapted to a teacher’s needs, and they are prototyping and testing LabBuilder with teachers this year. This service lets anyone use Labster’s simulated tools and lab environments to build their own labs, much as gamers use SimCity to build their own cities. Such flexibility is also emerging as a key driver for edX, which was founded by Harvard University and the Massachusetts Institute of Technology in 2012 to provide access to ‘massive open online courses’. It currently hosts some 2,000 courses with at least 130 institutions. They plan to shake this up, inventing a system that replaces discrete courses with an array of mix-and-match components, from lectures to lab simulations, that can be freely customized to anyone’s needs. “Imagine if you can cherry-pick from 1,600 courses exactly what’s relevant for your students. That’s changing the game,” says Robert Lue, faculty director at HarvardX, who heads the LabXchangeproject funded by the Amgen Foundation. Lue’s team is designing new 2D lab sims for their project and hoped to release the first of these as a pilot in September. They aim to focus not on procedures, such as loading a pipette, but on the process of experimental design: choosing an experimental approach, modifying a protocol, analysing the data, working out what went wrong, and doing it all again. But more than that, he adds, the virtual world lets all students, regardless of their real-world lab access, fail multiple times without cost, try out a limitless variety of variables and procedures, and crank through the whole process of science in a swifter, cheaper and more efficient way than is currently possible. It is doubtful whether virtual labs will completely replace real bench work in scientific training just yet. But that might not matter. “It’s not an either/or thing. It’s not like virtual labs are going to take over,” says Hamadani. “But when strategically used in the right way, they can improve all kinds of learning outcomes.” And for those who have no access to real labs, a virtual lab is better than no lab at all. de Jong, T., Linn, M. C. & Zacharia, Z. C. Science 340, 305–308 (2013). Bonde, M. T. et al. 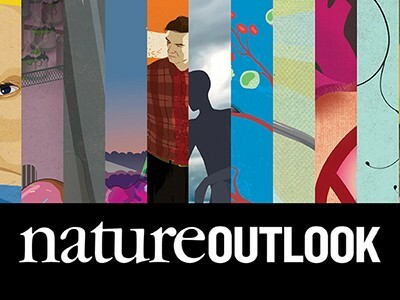 Nature Biotechnol. 32, 694–697 (2014). Makransky, G., Terkildsen, T. S. & Mayer, R. E. Learn. Instruct. https://doi.org/10.1016/j.learninstruc.2017.12.007 (2017).